Turnips are inexpensive, easy to cook and store, and very nutritious. 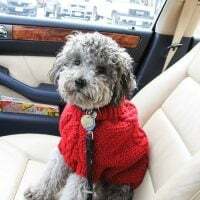 They are available almost all year round and are wonderful during the colder months of the year when not so many fruits and veggies are in season. But unfortunately, this vegetable is not very popular. You are not going to see many Instagram celebrities posting pictures of their turnip salad. Turnip or white turnip is a root vegetable that belongs to the cruciferous family together with cabbage, cauliflower, broccoli, kale, and a few others. Turnips are usually round and heavy for their size. They have smooth skin that is white at the bottom and light purple or greenish in the top part. In texture, the turnip flesh is similar to radishes but has a very mild taste. Fresh turnips are frequently sold with their greens still attached. Turnips without the greens are either packaged in plastic bags or sold loose. What to do with turnips? There are quite a few ways you can cook turnips. You can boil, steam, braise, or roast them. But the easiest way to enjoy turnips is to eat them raw. Raw turnips have a pleasant mild taste and can be eaten just as a snack the way you would eat a carrot. 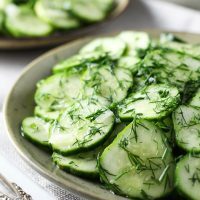 They also work great served as a part of a veggie tray or in a salad. Turnips are very nutritious. They contain vitamin B6, folate, calcium, potassium and copper, and are a very good source of fiber, vitamin C, and manganese. I couldn’t find the exact glycemic index of turnips. 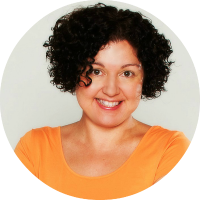 Some websites say that they are medium glycemic. However, according to this database, one medium-size raw turnip has a low glycemic load of 2. 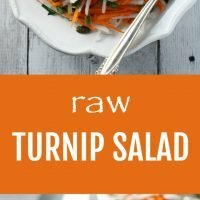 This raw turnip recipe is an example of how you can combine turnips with other raw veggies to prepare a quick and very healthy salad. 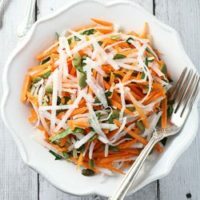 All you need to do is grate the turnips and carrots, quickly chop some parsley, add pumpkin seeds, olive oil, and lemon juice and mix everything to combine. This salad keeps well in the fridge for up to 48 hours. Keep in mind that once it’s grated, turnips will change their color from pure white to slightly yellowish and translucent. 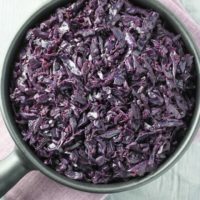 So, if you want to serve this salad for a dinner party and the appearance of the turnip salad is important to you, make sure to prepare it just before serving. 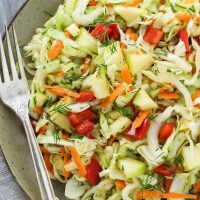 If you are looking for more raw vegetable salad recipes, check out this Healthy Cabbage Salad, this Red and Green Cabbage Salad, this German Cucumber Salad, and this Mediterranean Tomato Salad. 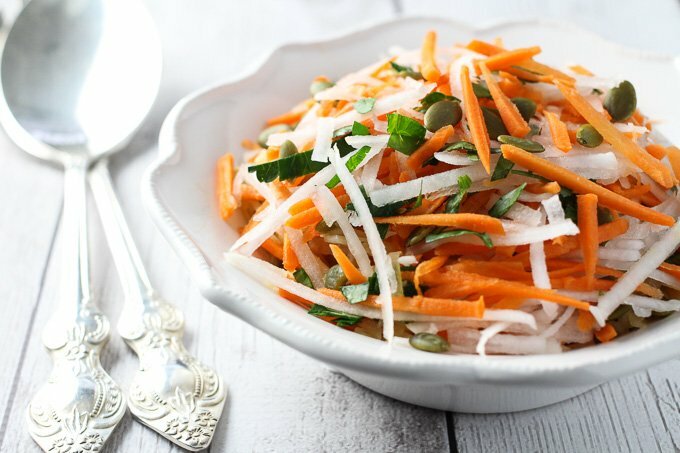 A very easy to prepare Raw Turnip Salad Recipe. 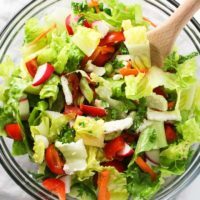 Just grate the vegetables, add the dressing and combine everything in a salad bowl. Full of fiber and healthy nutrients. 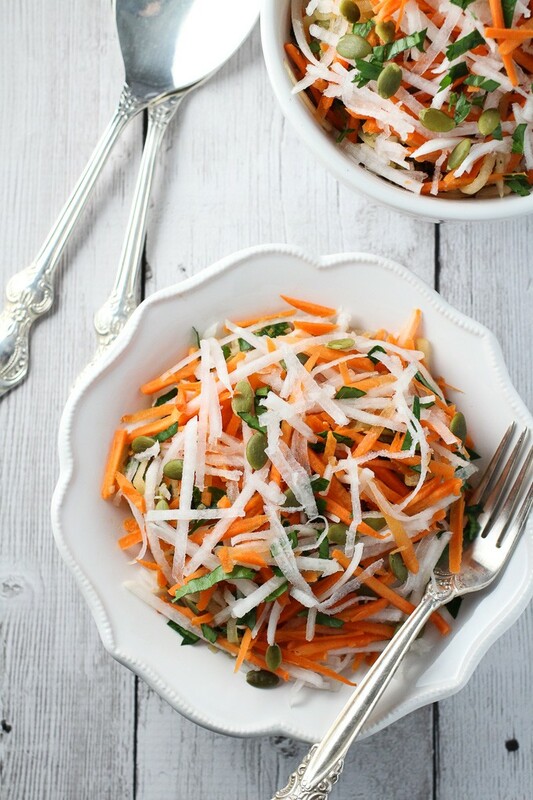 Place the turnips, carrots, parsley and pumpkin seeds into a salad bowl. Add the lemon juice and olive oil. Season with salt and toss to combine. 1. This salad keeps well in the fridge for up to 48 hours. 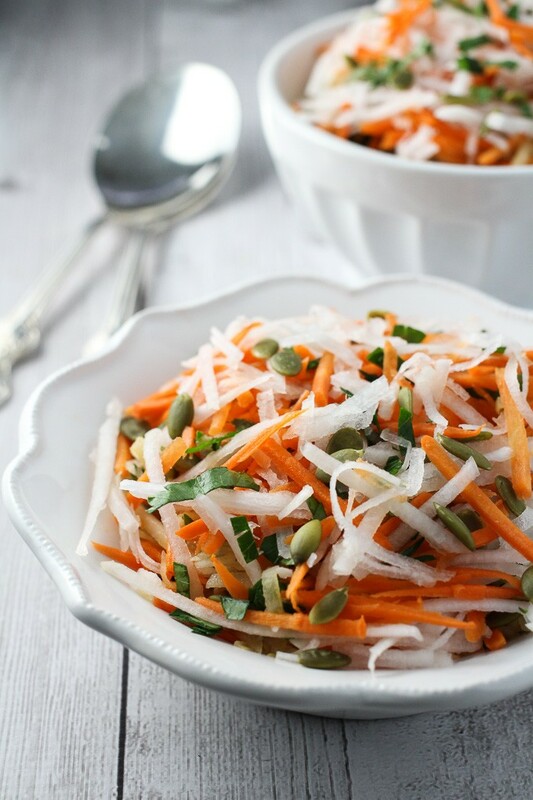 Keep in mind that once grated, turnip will change the color from pure white to slightly yellowish and translucent. 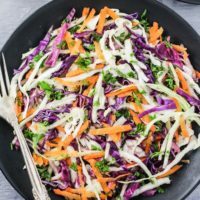 So, if you want to serve this salad for a dinner party and the appearance of the salad is important to you, make sure to prepare the salad just before serving. What type of grater did you use to get that texture? I have an old mandoline slicer and one of the attachments grates into these long thin strips. Thank you for a simple fast and delicious salad! I got wonderful fresh organic locally grown turnips and didn’t want to cook them. 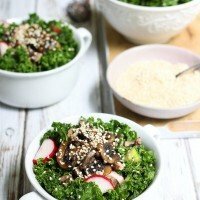 My husband and me really enjoyed eating them raw in this salad.